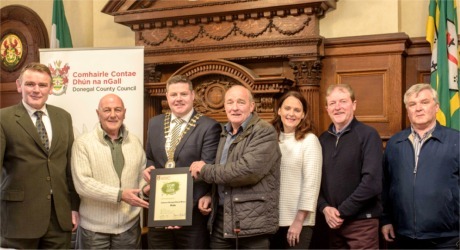 MALIN, along with four other Tidy Town Committees, received a Clean & Green Award from Donegal County Council at a special event in the County House in Lifford on Monday. These awards are aimed at recognising groups that have achieved high scores in the following three categories of the National Tidy Towns competition: Tidiness & Litter Control; Approach Roads, Streets and Lanes and Sustainability - doing more with less. Malin, along with Doochary, Donegal Town, Carraig Airt and Castlefinn Tidy Town Committees, received an award of €500 as they came out tops in these categories in the national competition for their own municipal district. Brian Watson and Hugh McColgan from Malin Tidy Towns Committee receiving a Clean and Green Award worth €500 from Donegal County Council Cathaoirleach Cllr. Seamus O’Domhnaill. Picture also includes Cllr. Niamh Kennedy, Cllr. Noel Jordan, Cllr. Gerry Crawford and Michael McGarvey, Donegal County Council. Michael McGarvey, Director of Water and Environment with the Council said “the Tidy Towns initiative has such a positive impact on the local community and we are keen to support groups that instil such positivity in their local community and their local environment”.